EU To 'Completely Ban' Outdoor Use Of Neonicotinoids, Blamed For Devastating Bee : The Two-Way Citing concerns for food production, the environment and biodiversity, the European Union moves to protect bees from a popular insecticide. "Bee health remains of paramount importance for me," said the EU's Commissioner for Health and Food Safety, after the EU moved to ban neonicotinoid insecticides everywhere except greenhouses. Here, a bee hovers near a peach flower. Citing concerns for food production, the environment and biodiversity, the European Union is set to "completely ban" the outdoor use of neonicotinoid insecticides that have been blamed for killing bees, and for keeping other bees from laying eggs. "All outdoor use of the three substances will be banned and the neonicotinoids in question will only be allowed in permanent greenhouses where no contact with bees is expected," the EU announced on Friday. 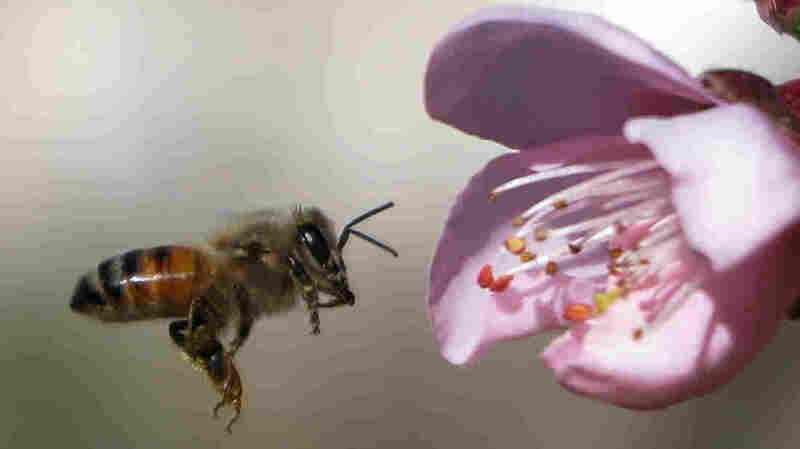 An EU committee approved the plan to tightly restrict use of the insecticides, acting upon scientific advice from the European Food Safety Authority to tighten existing restrictions and protect bees, crucial pollinators. The EFSA said in February that it had confirmed risks to both honeybees and to wild bees such as bumblebees posed by neonicotinoid pesticides. "There is variability in the conclusions, due to factors such as the bee species, the intended use of the pesticide and the route of exposure," the head of EFSA's pesticides unit, Jose Tarazona, said at the time. "Some low risks have been identified, but overall the risk to the three types of bees we have assessed is confirmed." Reacting to Friday's decision, Bayer CropScience, the biggest seller of neonicotinoids, called it "a sad day for farmers and a bad deal for Europe." Bayer added that the new rules "will not improve the lot of bees or other pollinators." Bayer and another pesticide company have already challenged the EU's existing restrictions on neonicotinoids that were enacted in 2013. A verdict in that case is due next month. Neonicotinoids work by becoming integrated throughout a plant's structure — instead of just coating the surface of leaves, for instance, the poison is sent to flowers, pollen and nectar. When insects encounter the material, their nervous systems come under a devastating attack. Widely used in U.S. agriculture, neonicotinoids coat the seeds of corn, soybean, canola and other crops, as NPR's Dan Charles has reported, and the insecticide has also been found to rub off and get blown into the air, creating a dust that's been blamed for killing colonies of both wild bees and honeybees. Welcoming today's vote to ban the substances, the EU's Commissioner for Health and Food Safety Vytenis Andriukaitis said, "Bee health remains of paramount importance for me since it concerns biodiversity, food production and the environment." In Europe, honeybees and many other species of bees play a key role in producing profitable crops from rapeseed and sunflower oil to cherries. In addition, as a recent EU study found, animal pollinators also support native plants and crops that "provide almost all vitamin C, vitamin A and other micronutrients such as carotenoids, calcium, fluoride, folic acid and several antioxidants in human diets." The insecticides' blanket label "neonicotinoid" means "new nicotine-like" — a reference to the fact that, "They are chemically similar to nicotine," the EU says. As one research paper put it back in 2004, "Nicotine, it turns out, is so toxic that it was one of the first chemicals used in agricultural insecticides."